Marmaris Historical Tours available with us include Ephesus & Pamukkale 2-Day Tour, Marmaris Ephesus Day Tour, Marmaris Pamukkale Tour, Marmaris Rhodes Day Trip, Cleopatra Island Boat Tour, and Marmaris Dalyan Tour. All these tours are unique opportunities to have a glimpse of the ancient history of places in and around Turkey. Apart from history, these places are known for their serene natural beauty and some of them offer opportunities for beach walking, swimming, snorkeling and diving. 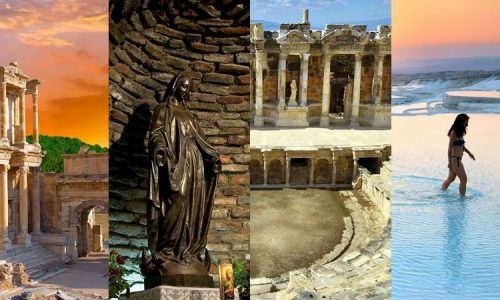 We offer excellent guided tours from Marmaris to most popular of the historical sites like Ephesus, Pamukkale, Cleopatra Island, Rhodes and the Dalyan tour. Our well-trained professional tour guides lead you to all the interesting sites and provide you useful information about these sites. 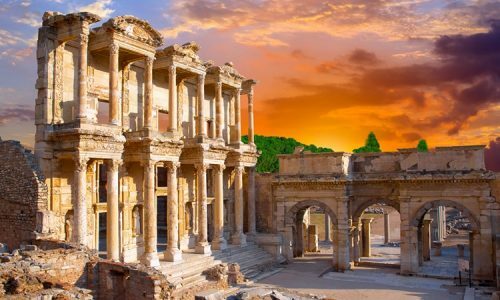 On our guided tours you will visit some of the renowned sites including the Temple of Artemis, the ancient Library of Celsus, the Temple of Hadrian and the remains of the ancient Amphitheater at Ephesus; the Cleopatra’s Pool, Hierapolis, and Necropolis during the tour of Pamukkale and the rock tombs of Lycia during our Marmaris Dalyan Tour. 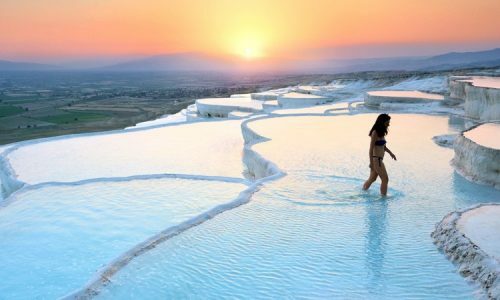 Ephesus and Pamukkale are two of the most popular ancient sites in Turkey. We offer our guests Marmaris Ephesus Day Tour, Marmaris Pamukkale Day Tour and Marmaris Ephesus & Pamukkale 2-Day Tour. Ephesus is nearly 190 Km northeast of Marmaris and Pamukkale is around 210 Km from Marmaris. We arrange these special tours in our most comfortable and air-conditioned buses. The journey to these places moves along the modern freeways and you can reach these places with ease. 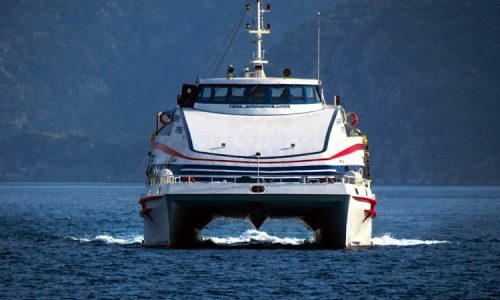 Marmaris Historical Tours such as Dalyan Boat Trip or Cleopatra Island Boat Tour offer you exciting opportunities to visit the historical sites by boat. 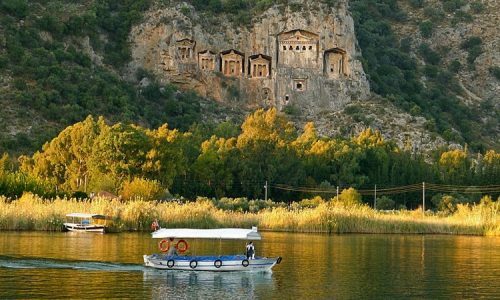 On our Dalyan tour, you’ll be traveling by boat as well as on land for some time. 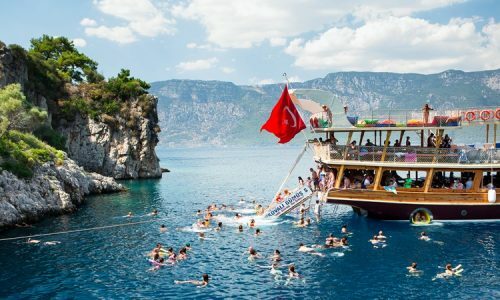 This is a daylong tour with visits to Lycian rock tombs, the Mud Baths and the Turtle Beach. The Cleopatra Island is one of the most popular destinations as well. This legendary island is known for its natural serene beauty and very special sand that squeaks under your feet as you walk over on the beach.